← Are you or someone you love considering weight loss surgery? And tune in Sunday to hear editor Amber Smith and humorist Jeff Kramer on Health Link on Air Upstate’s weekly radio program, airing at 9 a.m. Sundays on Newsradio 570, 106.9 WSYR. 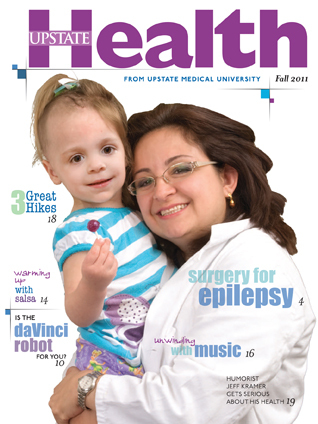 Amber Smith speaks about the consumer health publication and the types of articles readers can expect, and Jeff Kramer talks about his new column which appears in the magazine and on the What’s Up at Upstate blog the first Monday of every month. This entry was posted in community, HealthLink on Air and tagged academic medical center, health care blog, health care social media, healthy monday syracuse, hospital blog, hospital social media, medical blog, SUNY, syracuse health care, syracuse hospital, university hospital, upstate medical, upstate university. Bookmark the permalink.